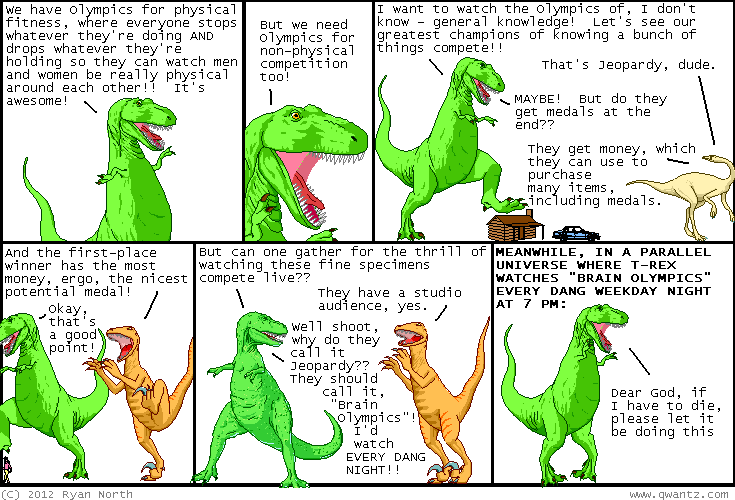 Dinosaur Comics - July 24th, 2012 - awesome fun times! –I have absolutely no idea who you are!! July 24th, 2012: WHAT ARE YOU DOING TOMORROW? SORRY FOR SHOUTING BUT I'M REALLY EXCITED FOR TOMORROW!! TOMORROW, WEDNESDAY JULY 25th, 1-3 pm: Mer and I sign at Little Island Comics in Toronto and there's an Adventure Time costume contest. And activities!! This one is for kids! TOMORROW, WEDNESDAY JULY 25th, 6-6:45 pm: Mer and I do an Adventure Time presentation at The Central and do a Q+A! TOMORROW, WEDNESDAY JULY 25th, 7 pm: There is a costume contest for adults that Mer and I judge! TOMORROW, WEDNESDAY JULY 25th, 7:15-9 pm: The signing for adults happens at The Beguiling with Meredith and myself! So it's going to be UH-MAZING and all the details are here, including an RSVP! I hope you can make it out because Adventure Time is awesome and comics are awesome!